The U.S. recession has been a time of intense economic hardship for many Americans. Unemployment and under-employment are out of control, houses are being foreclosed on, and corporations are firing their U.S. employees to pay foreign workers much less for the same job. 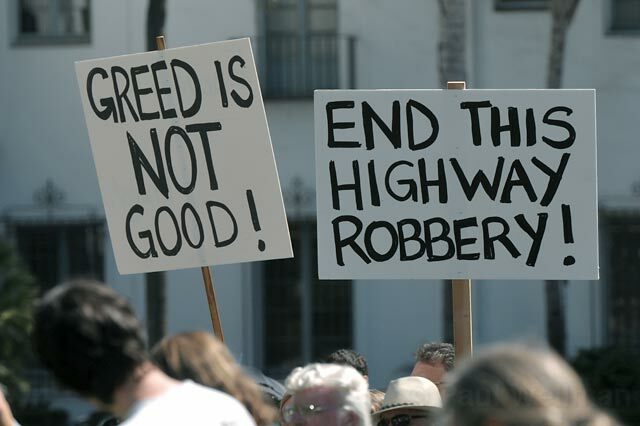 According to a recent Pew Research Center poll, the majority of Americans now support taxing the ultra-rich to help alleviate the national debt, and protests have formed on Wall Street to bring attention to the increasing disparity between the ultra-rich and the rest of the population. These protests have spread to 159 cities all over the country, including Santa Barbara. This movement of the people is mainly organized online at occupytogether.org and through Facebook and Twitter. 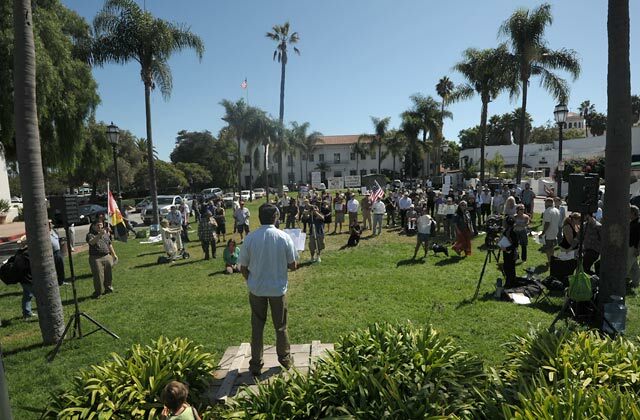 A crowd of about 200 concerned citizens gathered at the De la Guerra Plaza at 12:30 p.m. on Monday to protest what they call economic injustices. The crowd was energized and passionate while remaining peaceful and respectful of the surrounding area. “We are the 99 percent!” chanted protesters in reference to the top one percent of the country’s earners who hold the majority of the nation’s wealth. 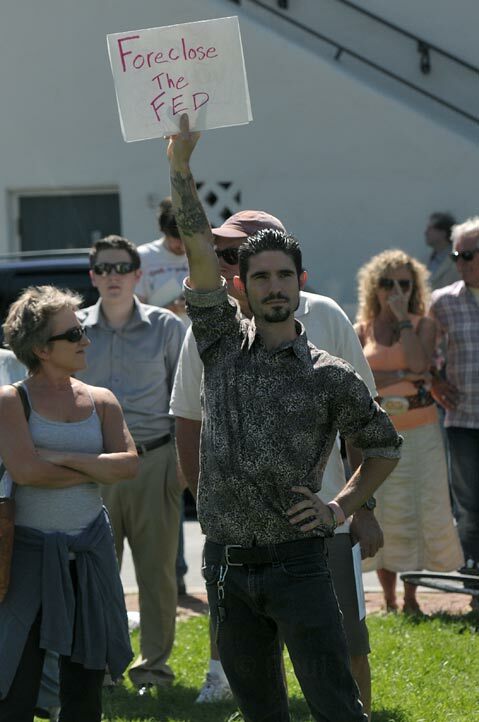 Demonstrators ranged from politically engaged UCSB students to concerned adults of all ages and creeds. People spoke of their personal experiences with foreclosure, unemployment, and struggling to send kids to school and to put food on the table. People proudly held up signs that read “Main Street NOT Wall Street: We’re the 99%”, “Greed is NOT Good”, “Make Jobs, Not War”, “Health, not Wealth”, “Stop the War on Workers”, and many other slogans along the same line. 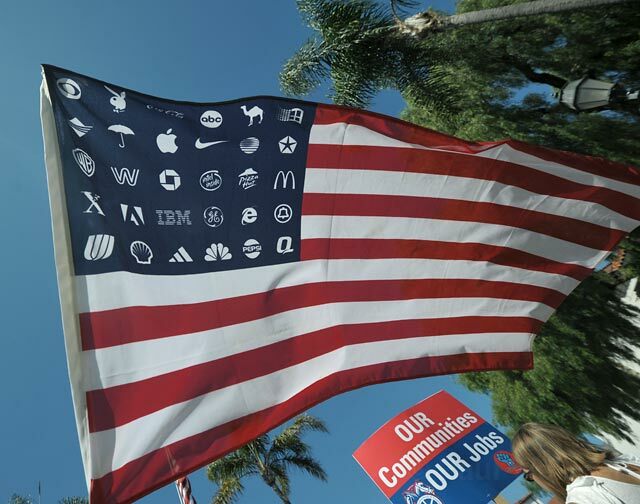 After a number of speeches, the crowd took to the streets of downtown Santa Barbara. The police overseeing the event told protesters that they were not allowed to march in the streets, so the crowd took to the sidewalks where police did not intervene. Lt. Doug Kresky explained that the SBPD’s primary purpose for overseeing the protesters was to protect their First Amendment rights as well as monitoring the situation to keep things safe and secure. The crowd walked from bank to bank, stopping at Bank of America, U.S. Bank, Bank of the West, Montecito Bank and Trust, and Wells Fargo to shout their protest at the bank employees and everyone who crossed their path. The crowd chanted forcefully, “Banks got BAILED OUT, people got SOLD OUT,” “Foreclose Wall Street!” and “We are the 99 percent! You are the 99 percent!” For the most part, there was very little response from the banks, with the exception of one employee at Bank of the West who stood in front of the group and proudly stated that his bank had not received bail-out money from the federal government, to which the protesters cheered and applauded before moving on. After the march, the demonstrators returned to De la Guerra Plaza to break into smaller groups to discuss how the events of the day had influenced them and what next steps could be taken to further their cause. Each speaker made it clear that this protest is neither the beginning nor the end of the nationwide struggle.